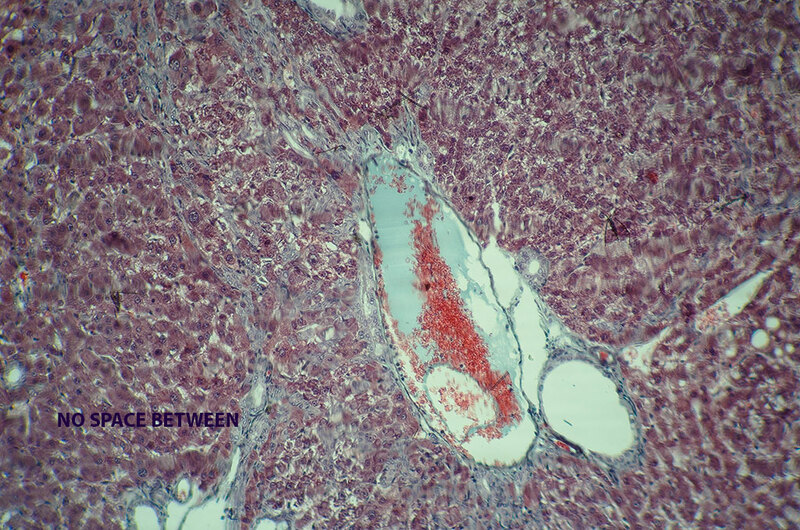 www.photomacrography.net :: View topic - Who tryed Olympus CHC microscope with APS-C body ? 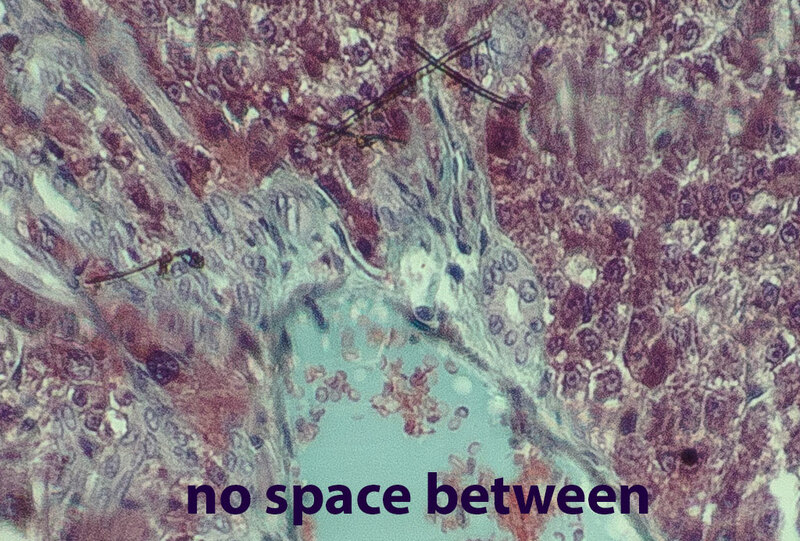 Who tryed Olympus CHC microscope with APS-C body ? Posted: Sun Apr 09, 2017 7:16 am Post subject: Who tryed Olympus CHC microscope with APS-C body ? After buying the Olympus CHC, I try to make pictures with it. I include 2 pictures, one taken without an oculair, the other taken with the Olympus oculair CWHK10X-T/18L. but the resolution of both pictures is very poor. Should I try to buy the Olympus photo eyepiece FK 2.5x (with adapters) or something else ? It's impossible to say without more information. - How did you attach the camera to the microscope, in particular, how did you take the image without eyepiece? - What camera and what camera lens did you use? - Did you focus the camera to infinity? - What was the exposure times? Do you have a camera phone? What kind of image do you get when you simply hold it up to the eyepiece? I attached the camera body Nikon D5100 on the microscope with an adapter that I use when I want to take pictures with my telescope. It is just a tube that I fixed on the fototube of the microscope, with a little help of tape, just to see what it would give on resolution. So I didn't use any cameraobjective. One foto was without microscope-ocular, the other with microcope-oculair: In the fototube of the microscope I put one of the two oculairs, and fixed the camerabody (with no objective) on it by the telescopadapter. I do not have a camera Phone, sorry. Thanks for providing the details. This is a complex mix of issues. By adapting the camera the way you did (direct projection and eyepiece projection), you used the optics way outside their design specs. 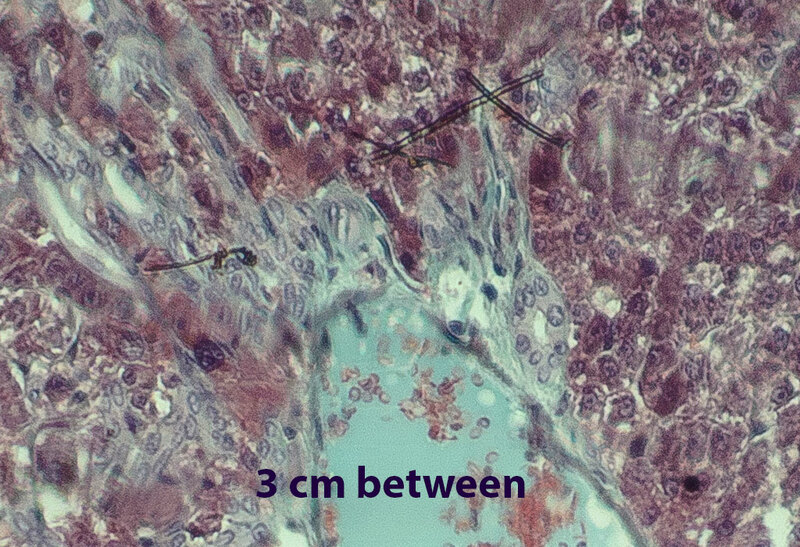 You effectively changed the tube length which, on a microscope, can quickly deteriorate the image. The tube length on this microscope is 160 mm. This tube length must be maintained for photography. 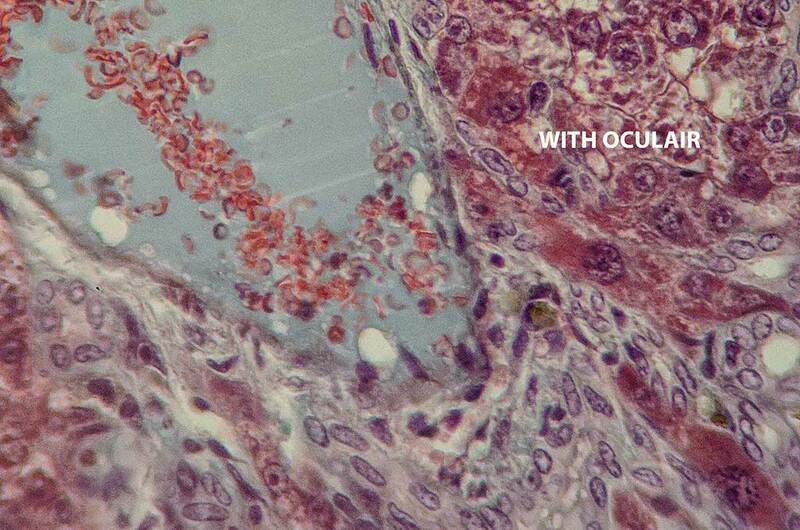 The microscope also requires colour-compensating eyepieces. You can only take photos through the Olympus eyepiece, which does the compensation. 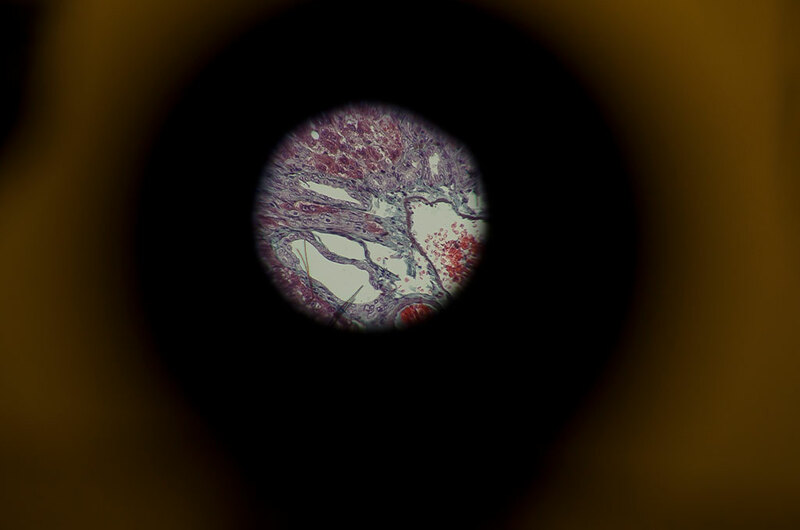 On a microscope, the eyepiece projects the image at infinity. The human eye, focussed to infinity, picks up the image and projects it onto the retina. To adapt a camera, it has to emulate the human eye. Focus the camera lens to infinity and place it in front of the eyepiece. It will pick up the microscope image and record exactly what the human observer would see. This approach preserves the tube length and colour correction designed by Olympus. 3) Mount a 50 mm prime lens to your camera. Focus to infinity (view outside the window); then de-activate the autofocus if present. Fully open the camera lens aperture. 4) Mount the camera to a tripod. 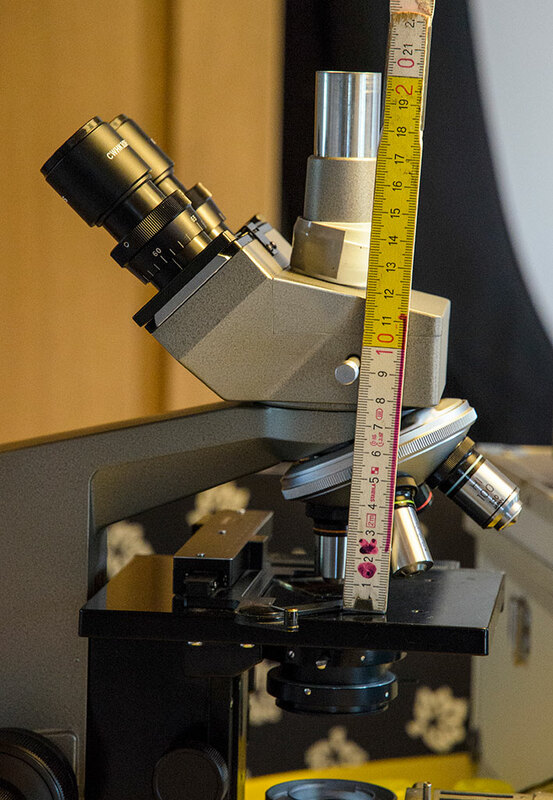 You need a tripod or something similar, the camera cannot be directly attached to the microscope. Hold the camera with 50 mm lens very close (few mm) in front of one of the eyepieces. Do not scratch the camera lens! 5) Look at the camera image though LiveView. It should already be in focus. If it isn't perfectly in focus, focus again using the microscope fine focus (only minimal movement should be necessary). 6) Does the camera have a histogram function?? Use it to find the exposure level that avoids overexposure. Take photos with a range of exposure times (approx 1/200s, 1/20 s, 1/2s, 2s); for this, you should use ND filters over the illuminator to adjust the light levels; if you don't have any ND filters, regulate the light level on the illuminator itsself (this changes the colour temperature but that doesn't matter at the moment). 7) See what exposure times give you the best images. It's likely that the longer exposures will be better. Hey Ichty, thank you for the detailled explanation. I did exactly what you said. I tuned the microscope optically. But I do not have a prime lens, so I used Nikkor 55-300 mm on 55mm F8 1/160 focus on infinity. Camera on a tripod, on 1mm of the top of the x10 oculair, remote control. Here the sensor is not filled, a lot of vignette shows. Then, I used Nikkor 16-85mm on 50 mm f8 1/160. Here I see even more vignette. Then I put this lens on 16 mm but it was the same. Can you explain what you mean bij tubelength of 160 mm? Do you mean the distance from the subject on the glas to the sensor of the camera, using the Olympus oculair x10 ? In my case the distance between the subject on the glas and the top of the Olympus oculair x10 is already 230 mm. You do need a prime lens. Zoom lens used at mid zoom will almost always vignette like that. As it is now, it is hard to tell whether or not you have successfully set up Kohler illumination. You need to see field iris in sharp focus. Do exactly what Ichty said, then you will he at 160mm tube length. Vignette is due to inadequate zoom lenses. You can buy for little money a good old manual focus 50mm f1.8 lens that will work very well. With a 10X eyepiece the field will be smaller than through the eyepieces but still convenient (2X relay magnification, less cropped than with the projective FK 2.5X. All it means for you is that you leave the eyepieces where they are; don't lift them ("eyepiece projection") and don't take them out ("direct projection"). Your images already look good (at the center). The vignetting is due to the use of a zoom lens. Zoom lenses always result in vignetting in this situation because the pupil of zoom objective is deep inside the camera lens. To avoid this, you need a prime lens. If it is a very flat version (pancake), even better. It doesn't have to be a fast lens and it doesn't need autofocus. All it needs to do is focus to infinity on your camera. I prefer fully mechanical lenses. I tested the Nikkor AI-S 50/1.8 pancake but it was not good (hotspot). I suspect that the Nikkor 50/1.8 AF and AF-D would work but I haven't tested them: http://www.kenrockwell.com/nikon/5018af.htm http://www.kenrockwell.com/nikon/5018daf.htm You can also test other 50 mm Nikkors. Whichever you can get cheaply and is compatible with your camera. * Edit: Some triple posting there We all agree! Thank you all for your advises. So, I need to get a prime 50 mm as flat as possible, but as I have a APSC-sensor, shouldn't it be better to buy an 35 mm so this will be 52 mm for crop sensors ? And then, the pictures will be simular in resolution than whith the special photoeyepiece of Olympus FK 2.5x ? So can you explain a little more please ? I may have confused you with the tube length. Don't worry about it any more. When you use afocal, as you do, the 160 mm tube length is maintained. It is measured from the nosepiece to the top of the phototube. On your photo: from the 20 cm mark to the 4 cm mark: 200 - 40 = 160! The prime lens: 35 or 40 mm would give you a better crop BUT you have normal achromat objectives which are not flat across the whole field of view. This shows even more in the photos. 50 mm is a good compromise. About chosing afocal or FK2.5x projective: Your choice! The quality should be similar but I haven't tested them side-by-side. Afocal photographs exactly what you see through the eyepieces so the quality should be high. The suggested combination (10x eyepiece, 50 mm prime lens) give you a magnification factor of 2x (10 x 50/250 = 2); that's less than the FK 2.5x so you will see a larger portion of the field of view in your photos. The older WF 10x is not 100% compatible with your newer CWHK 10x eyepieces. You could try to mix them (WF10x in phototube; CWHK 10x in binocular and use the adjustments rings to get everything parfocal, if possible). Or you get a full set of 3 identical eyepieces. Your choice. I did some testing with an Nikkor 50 mm 1.4 AI of a friend. The two pictures are a crop from the whole picture. 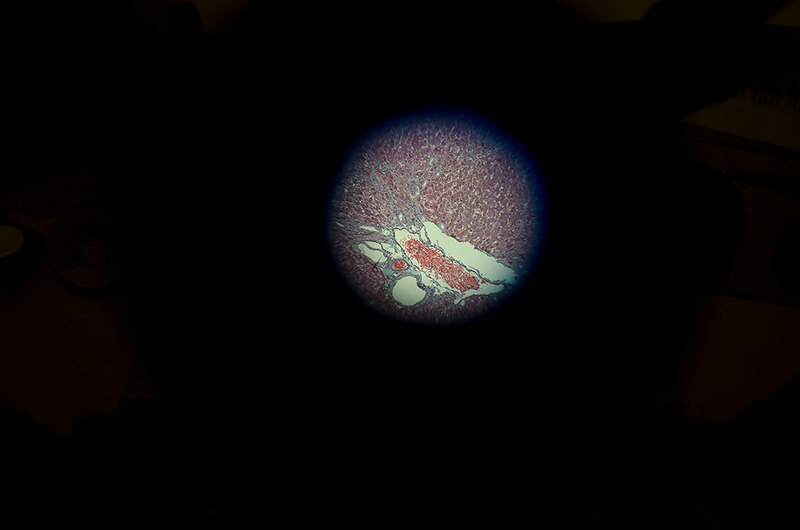 I held the camera (nikon D5100) so close to the microscope oculair, that there was just 1 mm space between the two. The second picture was taken with 3 cm space between them. I thought that the 3 cm space should blur the image, but this was not really the case. So I do not think that coming closer will give a sharper image ??? Should the Nikkor 50 mm 1.8 AI be a better choise ? There is also a long nose version. The Olympus eyepiece FK 2.5 isn't easy to find. The 1.8 lens will do the same. The advantages are that it is cheaper, lighter and shorter (could be less prone to vignette with some low eyepoint eyepieces). As Pau said, there will be vignetting at some point when you away far enough. There is actually an ideal distance between the exit pupil for the eyepiece and the entry pupil of the camera objective. In practice, most people just mount the lenses very close together (few mm) and it will work. The afocal adaptation uses only a very small central area of the camera lens (= the f-number is very high). So f1.4 or f1.8 makes no difference as such. The lens design matters and it's more important that you have no hotspots. Test all the magnifications, especially the 100:1 objective. It you have found one that works for you, keep it. Make sure there is no dust in the central lens area as dust would show on all your images! The crops you showed look OK. 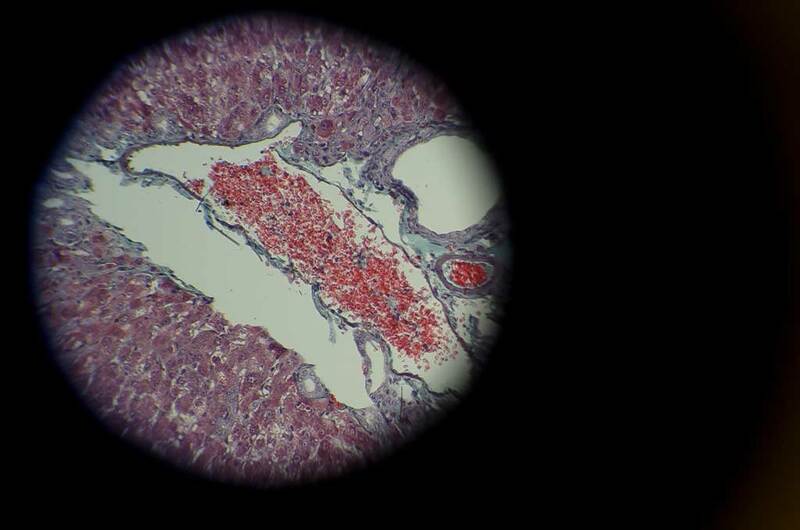 The red blood cells in the blood vessel are sharp. There seems to be no motion blur. To make sure, you need to compare different exposure times. 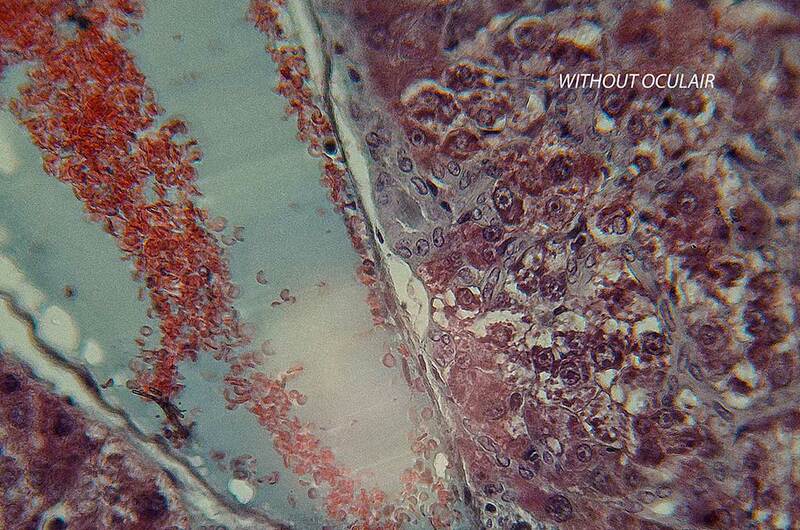 It is not useful to look at 100% crops on a microphotograph; they always look bad because of empty magnification. Could you please also post an image of the whole frame (with information on the objective)? This was taken with an old Nikkor 50 mm AI 1.4 focus infinite F2.8. I wonder if the Olympus eyepiece FK x2.5 would be much better ? The photo looks OK. There is sharp detail even around the edges. The corners are not sharp but that is to be expected with non-plan objectives. Lighting is OK as well. See if it improves when you do a 2s exposure. 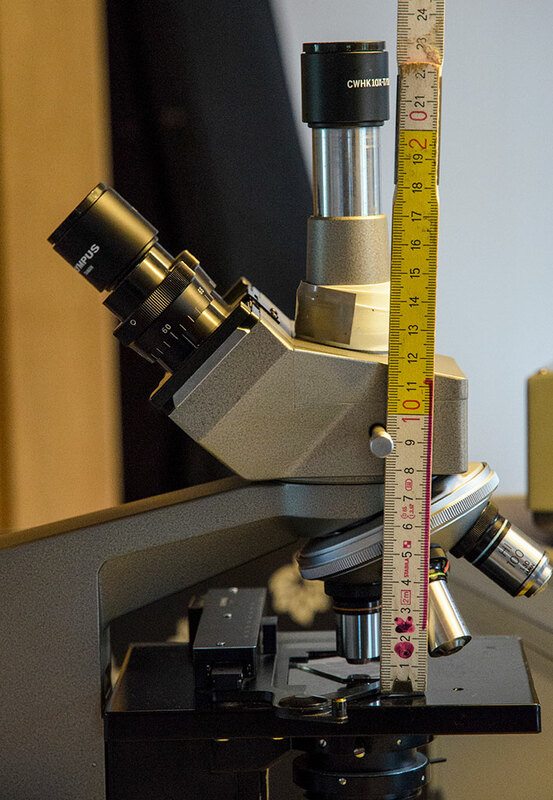 Sample preparation is the most important factor in microscopy, much more important than the optics or the camera gear. It will take you some time to master the techniques. If you want to improve your camera set-up further, you should also use a stage micrometer as a test object.